Your goods or products may need a very specific onsite storage solution due to their size, shape, or temperature requirements. If it’s a requirement of your business or industry that your goods or products are kept in a cool or temperature-controlled environment, our high-density mobile storage solutions are right for you. We supply our cool storage solutions to a wide range of businesses and industries throughout the world, who wish to benefit from keeping their stock protected and at the right temperature. Composed of conventional racking and shelving installed on mobile bases, they will help prevent your stored items from deterioration. Adjustable, extendable and fully customizable, they can accommodate a range of uses, from walk-in freezer rooms to cold storage facilities and other temperature-controlled environments. Find out more about the benefits of our mobile high-density storage systems. 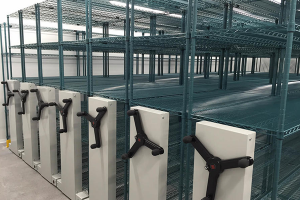 Our compact cold storage mobile racking and shelving systems combine high reliability and superior performance with effective energy savings. Operate at optimum efficiency, maximize your inventory and store it in ideal conditions without a financial freezer burn. There’s room to grow! 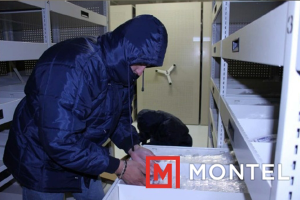 Let us tailor your cold environment mobile storage solutions to your needs. Benefit of various controls, technologies, remote features & safeties such as Smartphone remote control, automated aisles mobile system, automated ventilation mode or controller with PIN code for added security. Keep products at peak freshness, even in a cold storage environment, with dense mobile storage which is less costly to run. Accommodate various pallet sizes and weights and achieve greater flexibility for various food products. Maximize your floor space and get safe and easy access to your pallets. 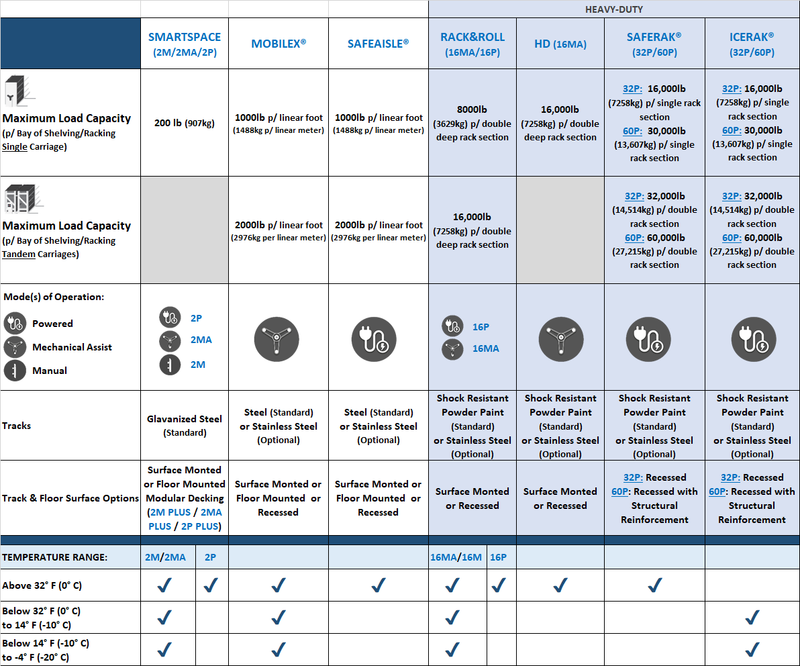 Keeping an entire inventory at a consistent temperature is an energy & resource-intensive endeavor. Businesses that can successfully manage & overcome these obstacles avoid financial freezer burn. Your goods or products may need a very specific onsite storage solution due to their size, shape or temperature requirements. If it’s a requirement of your business or industry that your goods or products are kept in a cool or temperature-controlled environment, our high-density mobile storage solutions are right for you. 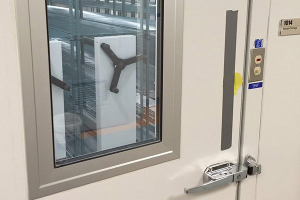 Adjustable, extendable & fully customizable, these systems can accommodate a wide range of uses, from walk-in freezer rooms to cold storage facilities and other temperature-controlled environments. Treat your products with utmost care with mobile racking solutions for cold storage. By adding Mobile Racking or shelving to a cooler or freezer you can store much more inventory in the same square footage. This reduces the need to build a larger cooler of freezer which can be expensive. In addition, a more dense mobile storage system reduces the utility costs for cooling the space as there is less space to cool. Precise climate control to reduce the risk of condensation. Pressure valve mounted on each control box. Steel festoon cable trolleys versus plastic ensures that all of the track mounted wires will move smoothly. Provides controlled equalization of pressure created by temperature variations. Built-in hot air convection system with preheat function, insulation and active status lights. 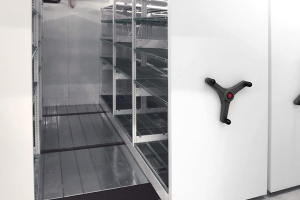 Fully customizable and expandable compact space saving design, which allow for many options and upgrades to suit most cold storage applications.